Sunshine Creations: ITS A SECRET!! 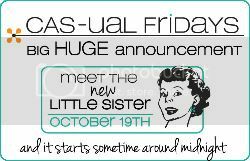 BIG HUGE ANOUNCEMENT OVER A CAS-UAL FRIDAYS!! AND THERE'S A BIG SUR-PRIZE! !